Penn's Landing hotels offer you the opportunity to be not only at Penn's Landing, per se, but also the chance to be close to the many attractions of Old City Philadelphia - which are too numerous to mention, especially its historic sites and nightlife. The Penn's View Inn occupies a 19th-century commercial building, which has been converted into a hotel. You also may have a good view of the Delaware River. 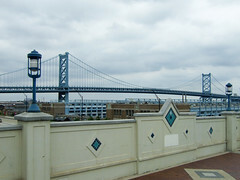 The Hyatt has a spectacular view of the Delaware River and the Ben Franklin Bridge. If you'd like to return to the Penn's Landing Main Page, please click here. If you'd like to leave Penn's Landing Hotels and return to the Home Page of Enjoying Philadelphia, please click here.